The SDMN5 is a portable, rugged dual-port manometer designed especially for HVACR field service technicians. Measures gas pressure, static pressure and pressure differential. The SDMN5 includes a zero adjust button of the face of the meter, a rugged rubber boot, a magnet on the back for hanging the meter during service, and the Auto Power-Off (APO) function conserves battery life. The SDMN5 measures pressure between -60inWC and 60inWC (inches of water column) and -150.0 to 150.0 mBar. The SDMN5 also measures P1 or P2 pressure readings and calculates the difference between P1 and P2. Take static pressure measurements using the resolution mode of 0.01inWC or 0.01mBar. Includes 3/16” to 5/16” adapter for measuring gas inlet and outlet pressures. The SDMN5 evolved as a result of testing pressures in the field for 20 years. Its range and resolution allow you to measure the HVAC applications you run into everyday in HVAC/R field service. 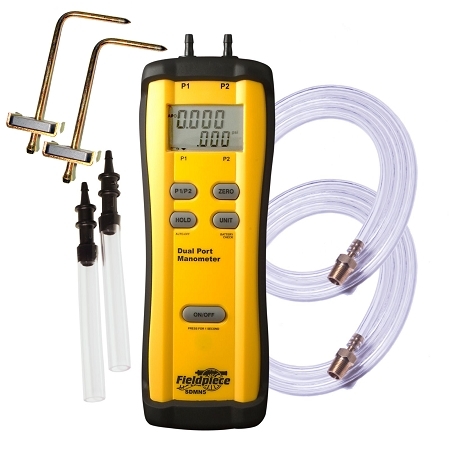 Measure gas pressure on the inlet and outlets with the standard 3/16” fittings or the included adapters for 5/16” ports, take static pressure measurements across a blower and get the pressure differential with the push of a button to check drafts. Whether you’re holding the ergonomic standalone shape in your hand or hang the SDMN5 on the unit with the magnetic hanger to fill out a work order, the SDMN5 make HVAC/R field service easier and faster, with less fatigue than the other guys. 189 TruReward$ points will be placed in your account when you buy this item.